Thanks to modern technology the robotic lawnmower has arrived, allowing you to spend your time more constructively. They are certainly not cheap, but what a time saver they have proven to be. They get on with their job quietly and efficiently and work away to ensure a perfectly cut lawn everytime. As a busy homeowner you don't have to spend ages mowing your lawn the old fashioned way. Just imagine, with a robotic lawnmower doing all the laborious work, you have more time to relax on your weekends with family and friends, rather than spend all your spare time cutting the lawn. However, before you rush out to get your hands on one of these amazing robotic lawn mowers, you need to consider a number of points, as they are not all created equal. In fact, many robot mowers are limited to the size of lawn they can actually mow. Generally this is around an acre or so and is unlikely to cause a problem for the majority of gardeners. The latest generation of mowers also feature a wet grass recognition system, in addition to rain sensors which prevents them from mowing wet grass. A lot of mowers operate from a docking point, and work within a boundary that is outlined by a boundary wire. Once setup, you simply need to schedule a program, and let it get on with it's job. Once finished it returns to it's starting point all on it's own. How neat is that? And of course you don't even have to be at home. These clever devices will carrying on cutting your lawn when you're doing other more creative things, or away from home. Currently some of the most popular mowers are manufactured by just two companies Friendly Robotics and LawnBott. 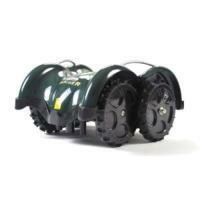 The Robo RL855 is the smallest robotic lawnmower in their range and is recommended for lawns of up to 1000sq metres. Other models in the range include the RL2000, RL200, and the RL400, each more having more features. Thr RL855 has 53cm heavy duty 3-blades mulching system and drop-and-go 24-volt batteries. Additionally it incorporates a manual controller for hassle-free transportation of the mower from the garage to the lawn and in between plots, as well as mowing very narrow areas manually. You can set the mowing height to between 26 and 63mm and the knobbly wheels are able to cope with high grass, sloping and bumpy ground. Further more it has a user controlled theft protection and disabling system to prevent it finding it's way into someone elses backyard. I really like the LawnBott LB1200 Spyder, it is one amazing device, as in contrast to other robots it doesn't require a perimeter wire. Uniquely it is able to acutally detect grass, so it will keep cutting until it come to a non grassed area. This robotic lawnmower features a 4-wheel drive and aggressive rubber tread design, so it is well equipped to deal with slopes up to 27-Degrees, and practically any backyard or grassy situation. Lithium-ion batteries keep the LB1200 Spyder going for upto five hours without the need for a recharge. And weighing in a just 18lbs is really easy to move about. You can finally forget about sweating on a hot summers day trying to cut your grass with a conventional mower,there are no pungent fumes to concern yourself with, no pesky insects biting you or allergies to mess up your day. When the mower has finished its work, merely put it back in your garage and hook up the charging cable so your LawnBott is always at the ready. Cutting a couple of times per week, your yard looks good all week long.